It was a big step in their relationship to adopt a puppy together and I'm sure she has brought them closer together. And now Kona is helping them blaze a new trail together as a married family. Good girl Kona! I know that when I go anywhere without my dogs I feel like something is missing. So it was important for me to include Kona in Jeff and Mary's wedding artwork, because it just wouldn't feel like home if Kona wasn't featured on the walls alongside of Mom and Dad. 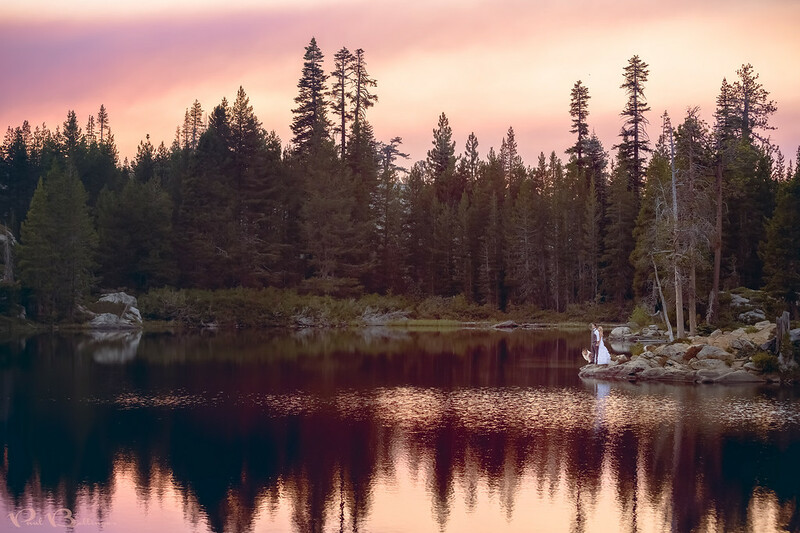 Jeff and Mary were such troopers to hike all the way to this little lake with all of their wedding gear. So I made sure we got plenty of good shots. This is one of my favorites because they have such a strong pose. Of course mother nature helped immensely. This is another artist signature edit. I enhanced the color and contrast to make Jeff and Mary pop and I added in Kona the dog because she was not cooperating with her poses!